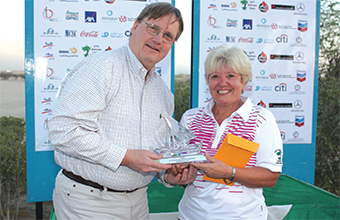 Starting day two in fourth place, Lynn St Lawrence, helped by a seven shot improvement compared to day one, came home as the overall winner, two shots clear of Susan Scott, who finished runner-up. Greeting the players on day one at the first tee was not only the usual referee, announcer and spectators but also winds gusting towards 30 knots. With the less than pleasant playing conditions remaining all day, scores were noticeably higher than in previous years. Sarah Hobday (gross 94), Scott (94) and Ariette Paul (98) went into day two as the lead group. Meanwhile, St Lawrence (gross 98) was in the second group, together with Danielle Sheppard and Jo Pawson. Banter in the clubhouse at the time centred on which of the lead group would turn out to be victorious. Hobday, under the weather for the whole weekend and sounding as though she should have been in bed with a hot water bottle (as did her caddy Peter Rogers) never regained her true form and faded from contention as the day progressed, finishing with 103. Scott fared better and provided the crowd waiting at the clubhouse with a glorious 3-wood onto the green from 140 yards out to finish with a par. However, a 4-putt on the 17th was where her chance of entering a play-off possibly slipped from her grasp and she finished day two with 97 to be runner-up, two shots adrift of the winner. St Lawrence, seemingly relaxed and playing in her normal competitive style, managed to navigate day two with no train-wreck holes. Additionally, she was a little unlucky on the 11th, her tee shot was seen to sail away slightly left. Looking for the ball near the left fairway line for the requisite time, none of the players or caddies could find it. Back to the tee then for a second tee shot. With the new ball in play, Lynn discovered her first ball near the centre of the fairway as she returned to catch up on her fellow players, the ball having struck a small tree. Prizes were presented by Dr Pete Bartlett, CEO of the platinum sponsor, Bapco. Club Captain Abdul Elah Fakhroo thanked the ladies for their participation and perseverance in light of the difficult conditions as well as the Opens Organising Committee and tournament director Bill Scarth. 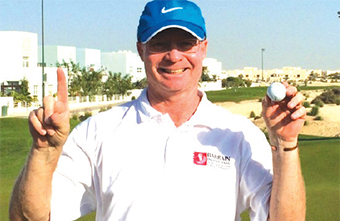 He also thanked those players who travelled to Bahrain from Dukhan Golf Club, Qatar: Jane Tomley and Lianne West. Dr Bartlett praised the ‘spirit of community’ amongst the competitors and their desire to keep the tradition of the competition alive. Danielle Sheppard, Yoy Young and Joan Martin were picked randomly from the players who were not in any of the main prizes, which were also given for best net on each day, best net and runner-up over both days and for the top six gross scores. Results – Champion: Lynn St Lawrence (189: 98/91), runner-up Susan Scott (191: 94/97), 3rd Sarah Hobday (197: 94/103), 4th Ariette Paul (198: 98/100), 5th Jo Pawson (201: 101/100), 6th Nicky Bailey (204: 105/99). Net both days: winner: Debbie Lane (163), runner-up Kerry Diaper (164). Best net Day-1: Nicky Park (81), best net Day-2: Roshni Khanna (79). A buffet and raffle draw was held in aid of the Captain’s Charity. Sunshine Tours, AJM Kooheji, Al Hawaj, Ritz-Carlton Bahrain, Hotel & Spa, Gulf Hotel, Movenpick Hotel, Awal Sport International, InterContinental Regency, Diplomat Radisson Blu Hotel, Swiss Food Specialites and Jasmi’s Corporation (La Chocolat) provided the raffle prizes. 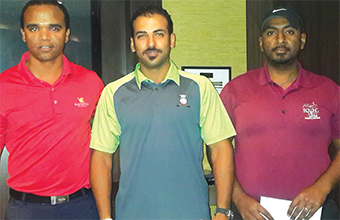 AGC is looking forward to hosting this weekend’s 52nd Bahrain Open Golf Championship.